They never left, really, but after they blew a three-game lead to Philadelphia in the playoffs last year, I swore off the Boston Professional Hockey Franchise, as I called it all summer. But I can't quit the Bruins. I never could. Maybe it's the sting of unmet expectations or the faint stench of failure that has hovered over this team since 1972, but something about the Bruins just keeps pulling me back in. (It's certainly not hope, not after last season.) I need them. Jack Edwards, the exuberant voice of the Bruins on NESN, is like an old friend who shows up and drinks beers on my couch every winter. I miss him when he's not around. Now, I'm training Isaac to be a fan. 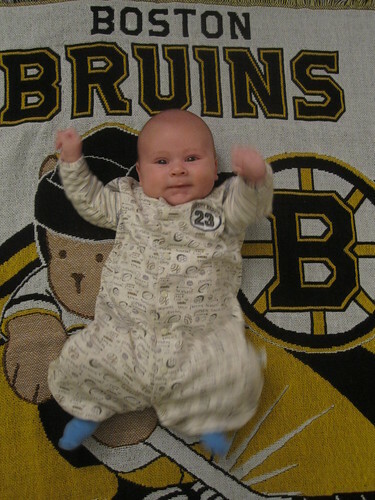 The first things I bought him, even before he was born, were a Bruins onesie and the Bruins throw rug you see in the picture. Hey, if I'm going to have to wait another 40 years for a Stanley Cup, I at least want somebody else to wait with me. And if the Bruins do manage to bring the Cup home, it'll be for the first time in Isaac's life--and for the first time in his dad's, as well. The Bruins beat New Jersey 3-0 tonight. It's just one win in a long regular season, but Isaac looked pretty happy about it.